Events are everywhere. From large in person events to jumping onto Facebook Live, all events - digital or otherwise- can build your community, brand experience, and luxury status. OR THESE SAME EVENTS CAN DESTROY ALL OF YOUR MARKETING EFFORTS. Creating a dynamic event experience is more about the craft than the cash that goes into it. WANT TO GROW YOUR COMMUNITY, CREATE SOCIAL PROOF, ALL THE WHILE OWNING YOUR EXPERT STATUS? THEN THROUGH AN EVENT...NOW NOT JUST ANY EVENT… A LUXURY EXPERIENCE ONE. LET US SHOW YOU HOW - DIGITAL OR IN PERSON. That’s what we create here at Entreventure Events. Check out a calendar of co-hosted events (see right) or set up time below to chat with us about creating a unique luxury event for you, your brand and your audience. EVENTS CREATE ENERGY AND INCOME. Events are a great way to train your audience on what to expect, how to act and react, and what's to come. From sharing the depth of your wisdom to offering a sneak peek into what your community is really like- events create and set expectations for all. And just like with Disney, we want our audience to be Goofy Gaga over working with us. Let's be honest, no one wants to work with or hang out with a "Debbie Downer." Your audience is attracted to your energy, how you move, how you speak- they are attracted to the electricity of your heart (literally). Live events are perfect for sharing your energy and magnetizing your audience on a psychological and biological level. Digital encounters happen every day. What if your next Facebook or Instagram LIVE was more than just an impromptu, rant about whatever topic was on your mind? What if your digital events be them “lives,” masterclasses, webinars or q and a’s were crafted experiences for your audiences- providing a level of detail and attention as if they were in person one on one with you? What if these mass events felt personal, intimate, and actually fun- vs. a never ending, “For the love of god, please get to it” pitch fest? They can! Let us show you how for your brand and your audience. Live events do not have to be massive affairs to have a massive impact on your audience. 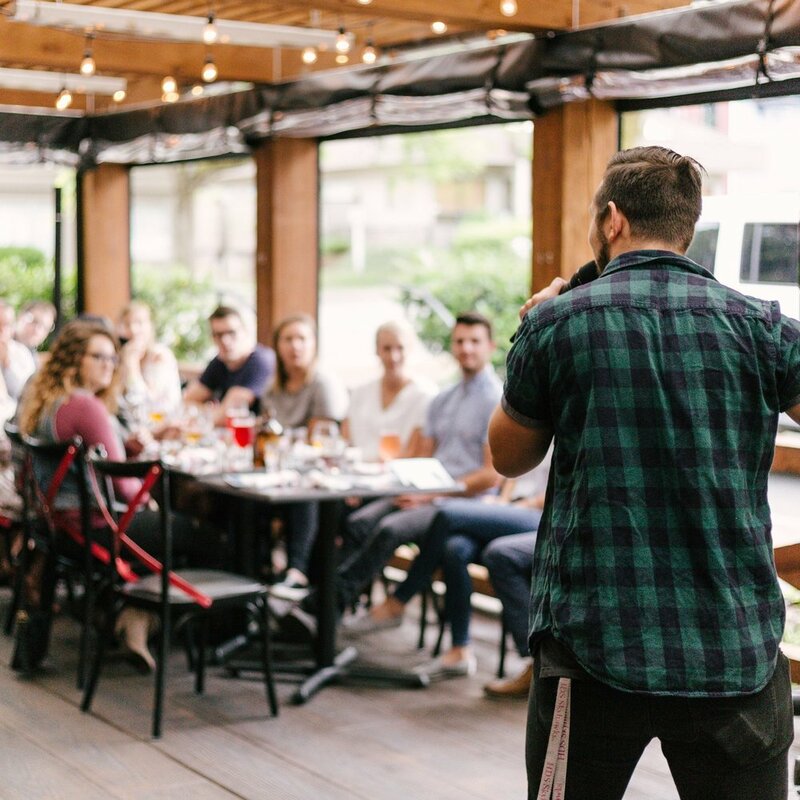 From 3 day live events, mastermind retreats, or maximizing your travel schedule for a book tour promotion or expert, in person “hot seat” events- live events bring energy and income to your brand like no other. Our expert team crafts every event with your brand experience and audience needs in mind. Rooted in science and psychology we make sure that everything from the venue to the view, the invitation to the entire experience feeds their true needs allowing your work or product to serve your audience at a deeper level in turn making you more of a rockstar in your audiences' eyes. Our clients love to partner with like minded businesses to help create mutually beneficial experiences for the sponsor and the audience alike. If you offer a product or service that makes life, work, relationships, and business easier - we may just have the person event partnership for you. SOCIAL PROOF IS MODERN MARKETING....IT IS HOW TO CREATE AN AMAZING BRAND EXPERIENCE, COMMUNITY, WHILE DEEPENING THE COLLECTIVE LOVE AFFAIR FOR YOUR BRAND. LET’S PARTNER YOUR AMAZING PRODUCT OR SERVICE WITH OUR AMAZING EXPERTS. YEP, THIS IS “TWO BIRDS ONE STONE” SOLUTIONS HERE.